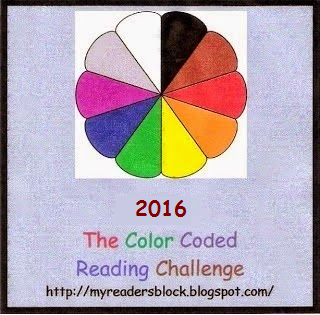 Any book read from January 1 through December 31, 2016 will count. A book with “Blue” or any shade of Blue (Turquoise, Aquamarine, Navy, etc) in the title/on the cover. A book with “Red” or any shade of Red (Scarlet, Crimson, Burgandy, etc) in the title/on the cover. A book with “Yellow” or any shade of Yellow (Gold, Lemon, Maize, etc. )in the title/on the cover. A book with “Green” or any shade of Green (Emerald, Lime, Jade, etc) in the title/on the cover. A book with “Brown” or any shade of Brown (Tan, Chocolate, Beige, etc) in the title/on the cover. A book with “Black” or any shade of Black (Jet, Ebony, Charcoal, etc) in the title/on the cover. A book with “White” or any shade of White (Ivory, Eggshell, Cream, etc) in the title/on the cover. A book with any other color in the title/on the cover (Purple, Orange, Silver, Pink, Magneta, etc.). Choose one or more awards categories to conquer. I am going to be choosing the categories Young Adult Fiction, Young Adult Fantasy, and Middle Grade and Children’s. Within the categories, there are different tiers. Choose which one you’d like to aim for. You can change this at any time. Young Adult Fiction Tier 1, Young Adult Fantasy Tier 2, and Middle Grade and Children’s Tier 1. You don’t have to choose the same tier throughout multiple categories. For example, you could aim for Tier 1 (1-2 books) within Historical Fiction, and Tier 4 (9-10 books) for YA Fiction. Some nominees are sequels. This isn’t a problem. If you haven’t started the series yet, then you can read the first book. If you are in the middle of a series, however, I suggest you get reading. If you quit the series and have no plans to continue, you can count the last book that you read. DNFs count. I’m not going to force you to read anything you don’t want to. So tick that box! So you might be wondering what this is. WELL. Some of you might want to shoot for the stars and read more than ten books within a category. Meaning, you’d have to look past the finalists and read one or more nominees which didn’t make it to the final round. Good luck, you brave souls. This is just a few of the awards categories that I picked up from Goodreads. You can choose other genres if you like, but I didn’t think many people would be going for cookbooks. These are just the finalists, if you want to see all the nominees then you can view those on Goodreads.